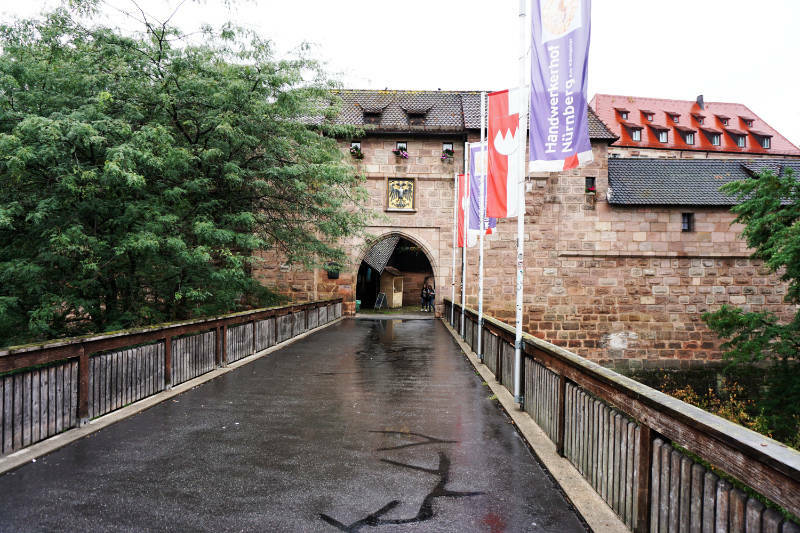 We go into the Handwerkerhof (craftsmen’s courtyard) via a bridge from the central train station to the main entrance of the Handwerkerhof. The weather was awful and that was certainly the reason why not many other visitors were to be seen. Small shops are nestled into the half-timber houses in the narrow alleys. The goods that are sold here are partly traditional craftsmanship, partly targeted at tourists. There is also no shortage of food. The main cuisine here is Frankish. I liked the Handwerkerhof quite a bit and I think it shouldn’t be missing on a tour through Nürnberg. Especially around Christmas this area is always busy and a good spot to find lovely gifts. The Nassauer Haus (Nassau House) is opposite the Lorenzkirche. 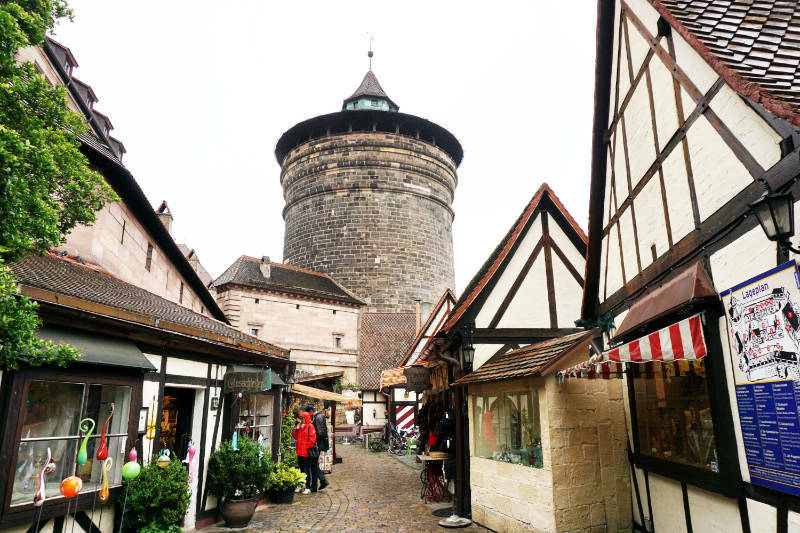 It is the only tower house that still exists in Nürnberg and one if its most famous buildings. It really stands out between all the half-timber houses. The tower is made of red sandstone. The tower was probably never used for defence. The alcoves and the armorial rim are particularly eye-catching. 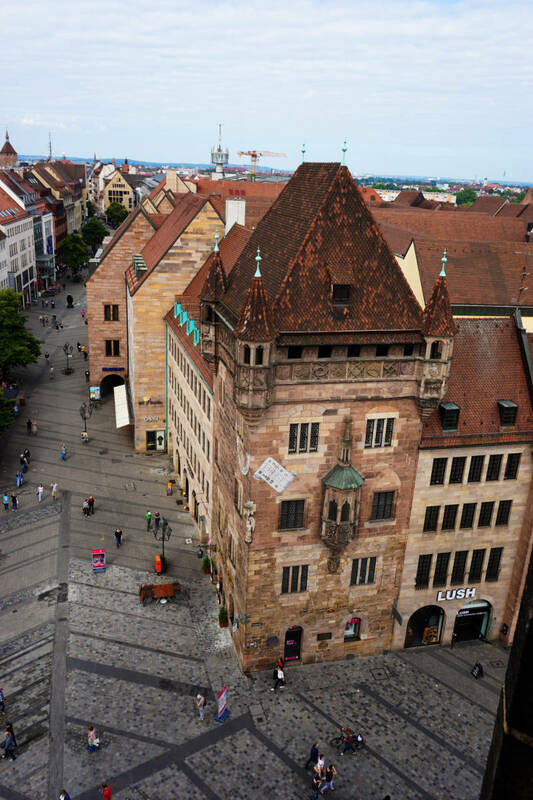 Nürnberg is the hometown of Albrecht Dürer and in many places all over the city, one can find his traces. Who was Albrecht Dürer? Firstly, Dürer was a passionate scholar of Humanism. But his fame stems more from his art. He was a painter, drawer and graphic designer, he wrote pieces on proportion theory, geometry and fortification. Dürer’s “praying hands” and “young hare” are his most reproduced pieces. 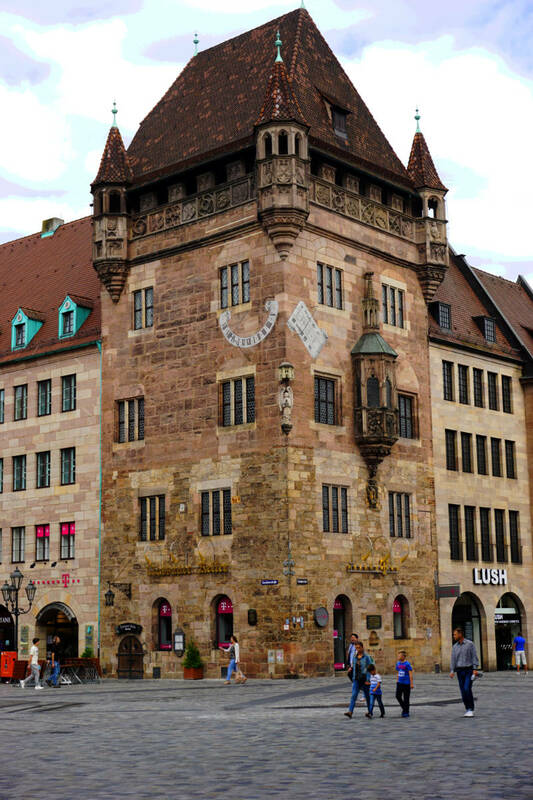 The Albrecht Dürer House is in the old town of Nürnberg. A really lovely four-storey half-timber house. It houses a museum about the life of Dürer. 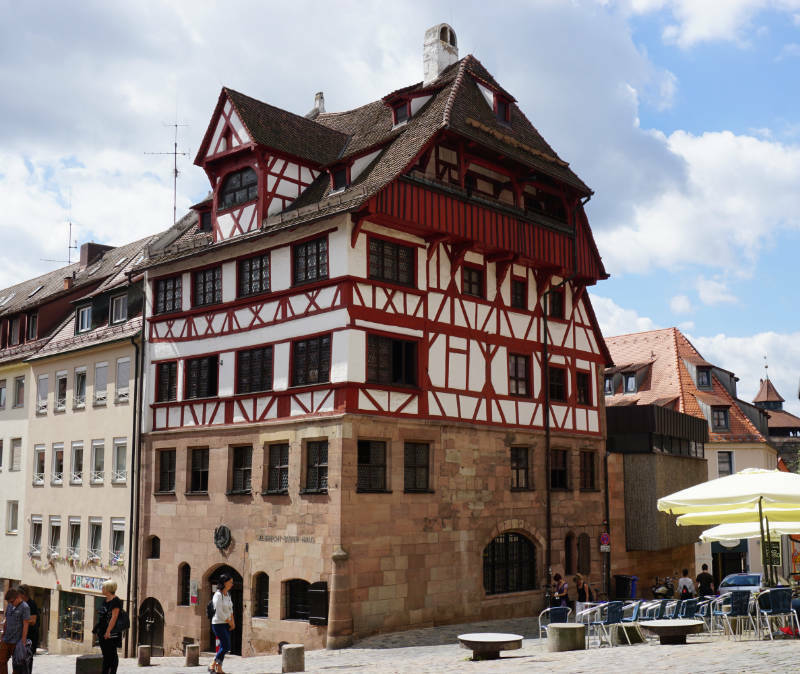 Visitors get to see a piece of 16th century Nürnberg through the living room, kitchen and workshop of the artist. Additionally, pieces from the vast graphic design collection of the Nürnberg Museum are on display as a permanent exhibition. We ate on the square in front of the Albrecht-Dürer-Haus and watched the hustle and bustle of the city. A very nice spot to stop and rest for a while. The Fraunekirche (Church of our Lady) is on the Central Market Square. It is one of the most important churches of the city. Karl IV. gave it to the city in 1355. It was supposed to hold the imperial regalia such as the emperor’s crown, coat and sceptre but that never happened. The Church of our Lady is the first Gothic hall church in Franconia. There is a lovely short guide with more information on the history and construction of the church to download from their website. We arrived at the central market square in front of the church at 12.00 on the dot. Every day visitors gather here to see the “little men run”. 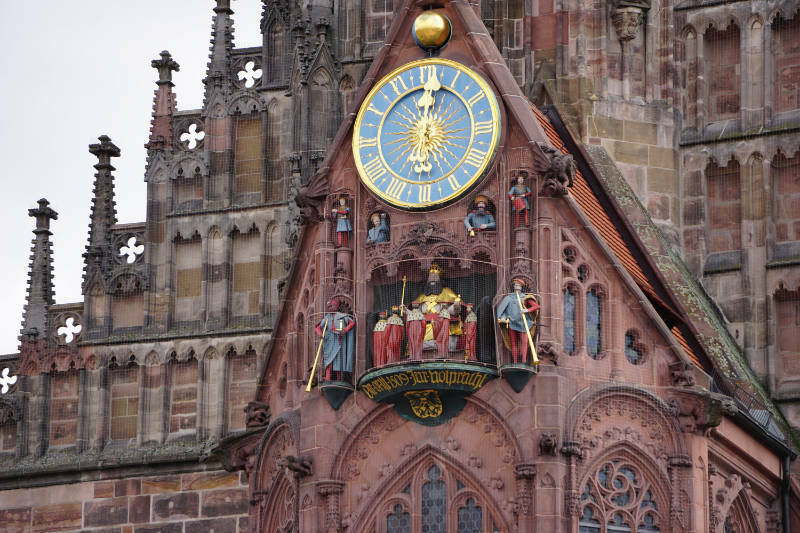 Underneath the rather pretty clock the 7 elective prince-electors worship the Roman-German emperor Karl IV. by hurrying past him. 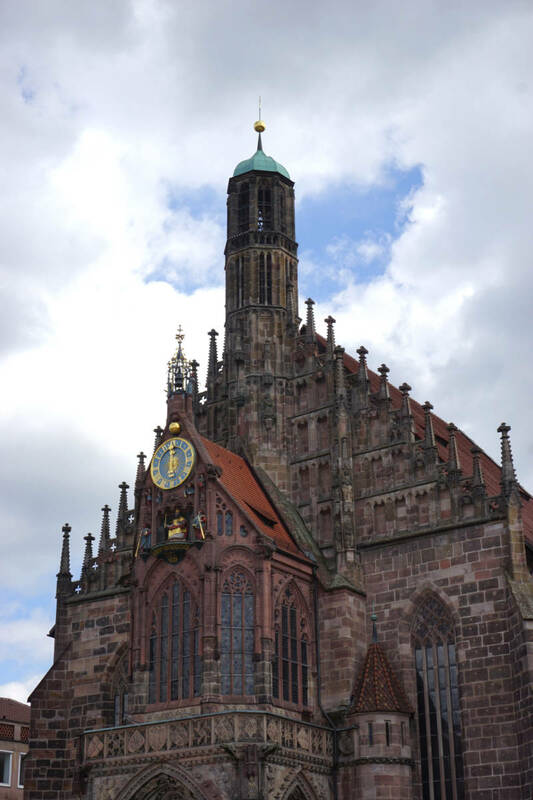 The worshipping is over quickly but still worth seeing and worth planning to see whilst exploring the old town of Nürnberg. The interior of the church was a bit of a letdown. Maybe it was because we had just seen the very impressive naves of the Lorenz church and the St. Sebald church. The Frauenkirche is, as opposed to the other two, rather plain and simple.